Details: Dietary Supplement. 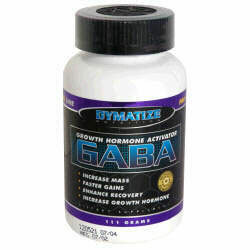 GABA (Growth Hormone Activator). Increase mass. Directions As an adult dietary supplement, take three to five grams mixed with 4 ounces of water or juice approximately 30 minutes before sleep. Because of GABA's Neurotransmitter Properties, some individuals may experience a minor tingling of the skin and/or a slight shortness of breath shortly after taking Gaba. These symptoms will quickly subside, and are characteristic of this Amino Acid.